Antique silverplated artnouveau art and craft tea set. 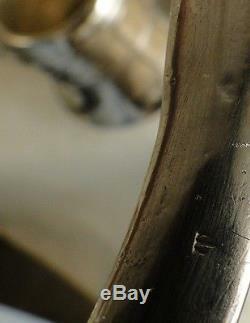 Original tray manufactured with silverplated metal. Tea pot, sugar pot and milk pot manufactured. Tray measures: long 55 cm width 29 cm. Height tea pot: 17 cm. 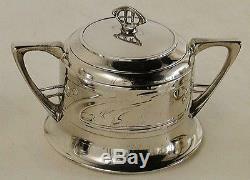 Height sugar pot: 10 cm. 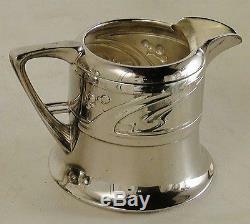 Height milk pot: 8.5 cm. 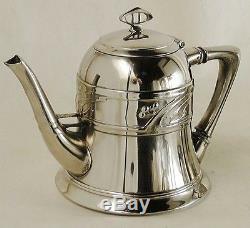 The item "Antique silverplated artnouveau art and craft tea set" is in sale since Friday, September 26, 2014. This item is in the category "Antiques\Decorative Arts\Woodenware\Boxes". The seller is "preciosuras" and is located in capital federal, buenos aires. This item can be shipped worldwide.